I’ve been delving into more “classics” of late, due to the fantastic collection of public domain work on archive.org. Books here are free to read, and audiobooks are free to listen to. And I’m finding listening to these stories very enjoyable. So far I have listened to The Woman in White, The Strange Case of Dr. Jekyll and Mr. Hyde, Daddy Long Legs, The Turn of the Screw, and currently Jane Eyre. I thoroughly enjoy letting my eyes rest while still getting to experience great literature. I also think I am understanding some of the more dense novels, or at least staying more focused on the more long-winded passages, better than if I was reading it to myself. 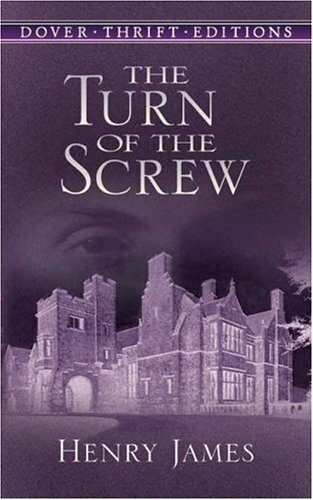 That being said, Henry Jame’s The Turn of the Screw has been my least favorite of this recent spate of classic literature. I have read one other short story of Henry James, in a collection of horror, and did not find it satisfying either. So perhaps Mr. James and I just aren’t meant to be. A Christmas Eve is spent spinning ghost stories in front of a fire with a group of companions (side-note: for a great book that starts this way read The Woman in Black by Susan Hill). And our storyteller says, well if one child haunted is frightening, imagine the terror of two young ones haunted by two different specters. And so begins his tale of the governess and her two young charges. It is clear from the beginning that the children’s uncle does not want to be bothered by any goings in the house. And so when the governess begins to see ghosts, and the house staff wont tell her the house’s secrets, she is on her own to protect the children who are the focus of the hauntings. The question becomes whether the children are aware of these ghosts, or is the governess a little off her rocker? The mood is dark and the tone is ominous. The setting is, appropriately, a dark, secluded estate. James’ ghost story is about the corruption of innocence, not just by the evil of the haunts, but also by the suspicions of the governess. The obsession of discovering the truth behind the ghosts also drives a wedge between her and the children, leading to the final terrible outcome. All together it sounds like a pretty decent ghost story. Perhaps it was just a bit to old-fashioned, although there is a strange sexual undercurrent as well. And to explore this taboo theme, James of course had to beat around the bush a little bit, considering the time period he wrote. So some passages become long, sentences tangled, meanings hidden. And this lessens the fear factor a bit, and make the story drag as well. I will say that I was surprised by the ending, bravo on that Henry James! A must read for horror aficionados, but I don’t believe James is my favorite Victorian author. This entry was posted in Book Reviews, Classic Literature, General Fiction and tagged book review, Fiction, Henry James, Horror, The Turn of the Screw, Victorian LIterature. Bookmark the permalink. 1) The governess really sees the ghost and tries to keep the children away from her. 2) She is insane and she is imagining everything. I loved the ending too, it shocked me (kind of The Woman in Black’s did). I would also say that it is part of the horror canon and it has many modern rewritings and readings. To sum up, a classic.